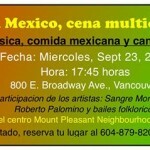 Music, Mexican Food, and Song! Sangre Morena, Popular songs and the appearance of Lourdes and her folk dance. This is a family event, includes dinner with a donation of $5 per adult and $3 per child. Remember: This is a limited event, so please remember to buy your tickets at the reception desk at the community centre.